IRC turns 30! This Finnish invention was revolutionary and changed lives. And it lives on. 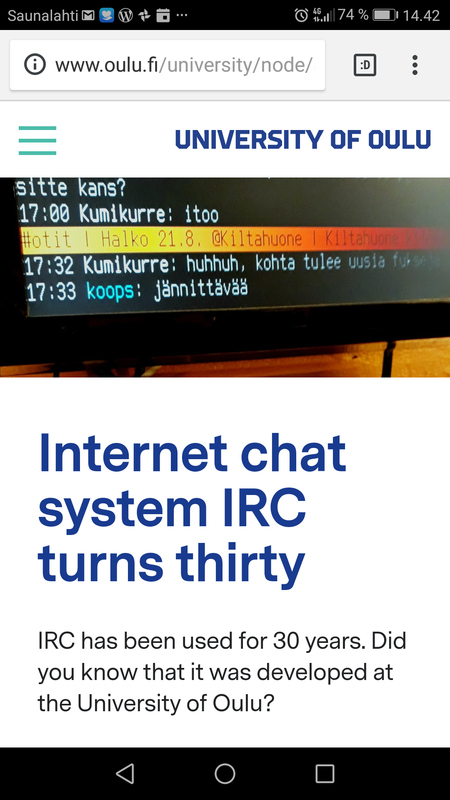 IRC (Internet Relay Chat) was born at the Department of Information Processing Science of the University of Oulu 30 years ago. Jarkko Oikarinen developed the internet chat system back in 1988. “IRC is great—it was even the subject of a hit EDM song!—but it definitely has never been polished,” adds Motherboard. Jarkko Oikarinen famously created IRC while he was still a college student. “IRC started as one summer trainee’s programming exercise,” he once wrote. So how long did it take to build IRC? “The first versions which were tested within Finland were coded in maybe three to four months, with help from several other people in Finland.” Jarkko doesn’t remember the exact day he finally launched IRC, though he remembers it was in August.